Lanark United led by two goals with only 20 minutes remaining against Royal Albert at Moor Park on Saturday, writes Tam Anderson. But a dubious penalty award by referee Gary McLean and an equaliser deep in injury time gave the visitors a share of the spoils in this Division 2 clash. A big talking point came just before half-time when an Albert player put in a terrible tackle on Ronan Kearney, catching him just below the knee which was the end of the game for him while incredibly the referee issued only a yellow card to the offender. United took the lead from the penalty spot when Sean McKenna scored after he was held back when about to shoot. Lanark keeper Gareth Hallford saved well from Alan Campbell before United took a two-goal lead on 66 minutes when Martin Hannaway headed in a left wing corner. The visitors were awarded a soft penalty on 81 minutes when Jason McCrorie was penalised for his hand touching a defender on the face in a crowded area. Chris Dolan gave Hallford no chance with a powerful shot. Four minutes into injury time, Campbell slotted home the equaliser to leave United hugely disappointed. 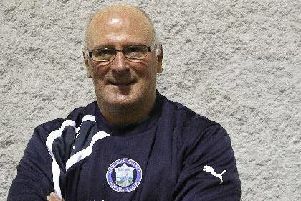 Managerless United hope to appoint John Brogan's replacement this week.